EXCELLENT FOR MUSICAL WASHBOARDS, VINTAGE CARS, CLOWNS & ENTERTAINERS. Mini Brass horn features small bell. The compact bicycle-size design generates a loud blast, yet stays out of the way and keeps a low profile. REPRODUCTION ANTIQUE-STYLE BULB HORN: This instrument is handcrafted yet budget-priced. It resembles vintage bulb horns your great-grandad might have seen on early motorcars from 1900 to 1915. MINI HORN IS SMALLER THAN IT LOOKS: Easily held in one hand, this cute little horn measures just 8-1/2" (21.59 cm) in length and features a small 2-3/4" (6.98 cm) diameter bell, removable reed, and mini squeeze bulb. ATTRACTIVE BRASS FINISH: Made from real brass that achieves an attractive antique patina with age. Or keep finish shiny with any commercial brass polish. 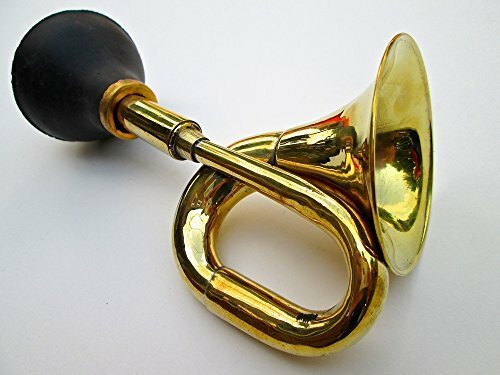 WHY CHOOSE THIS HORN: If you want a budget-priced, antique-style, light-weight, bicycle-sized brass bulb horn with a loud honk that's small enough to stay out of the way and keeps a low profile, then this horn is for you. Mounting hardware not provided. TECHNICAL SPECS: Length: 8-1/2" (21.59 cm); Weight: 4.8 oz; Bell Diameter: 2-3/4" (6.98 cm); Bulb Diameter: 2-1/2" (6.35 cm); Bulb Circumference: 8-3/16" (20.8 cm); Brass Tube ID (Fitting): ~9/16" (1.43 cm) at 28 tpi (threads per inch); Brass Tube OD: 5/8" (1.59 cm); Reed Type: Tongue and shallot; Reed Mount: Tapered thread; Reed Construction: Solid brass, or metal tongue w/plastic threads & shallot. SMALLER THAN IT LOOKS: Tiny bicycle-size horn is compact, generates surprisingly loud blast.